Hi guys, I hope you're all having a great week so far! Stockpile is a silver linear holo with silver flakies and silver holo glitter. I used 2 coats plus topcoat. Record Keeper is a gold linear holo with gold flakies and gold holo glitter. Two coats plus topcoat shown here as well. Vivid Dreams is a jelly based bright pink with iridescent flakies. Pictured below : 2 coats plus topcoat. CrestFallen is a royal purple packed with pink shimmer sparkles. I also used 2 coats plus topcoat. Erratic Behaviour is a grass green linear holo. Perfect in 2 coats plus topcoat. Forever and Ever is a creme based medium teal holo and a COTM polish (Charity Of The Month polish, each sale occasioning a $4 donation to a local charity). Again, I used 2 coats plus topcoat. Corsetry (Color4Nails exclusive) is a pale grey crelly with a subtle holo and a mix of silver and pastel micro shimmers. Another easy 2 coater. Vintage Rose (Color4Nails exclusive) is a medium pink with an antique rose touch and a strong linear holo. I also used 2 coats plus topcoat. I really enjoyed these new releases with their flawless formula and rich colors. My favorites are Stockpile, Vivid Dreams and CrestFallen. 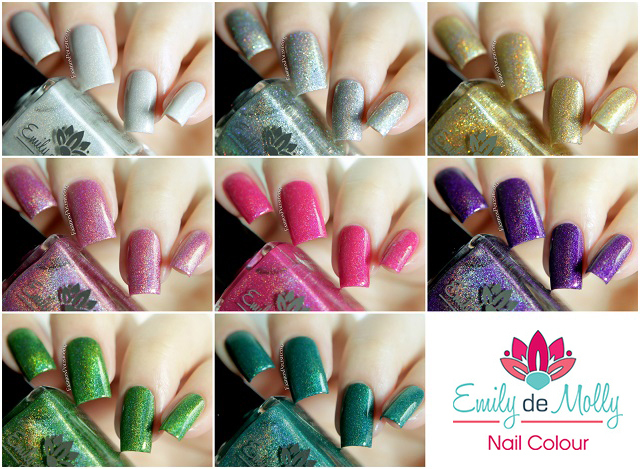 You can purchase these Emily de Molly from Color4Nails.com, retail price is $12 each except for the store exclusives which retail for $13 (international shipping available).